We rescued Lulu from the Fairmont shelter here in Cal. She has had eye surgery last Thursday for an ulcerated eye. I will have her up on our site a little later today. I will attach pictures with this email though so you can all see her sweet little face. She is about 12 pounds and is about 6 years old. We are looking for a home with no children or other dogs or cats and someone who is home most of the time like a retired single person or couple. She needs drops and ointment put in her eye about 4 times a day and constant care so the eye will heal properly. She is UTD on shots and is spayed. aGrange-Troup County Humane Society, Inc.
4/26 Cheers! I am a special needs little guy, but don't let that scare you off. I am deaf, but can be trained with sign language, just like a hearing dog. Miss Holly from the Humane Society can teach you a few sign language commands, or you can make up your own as you go along. 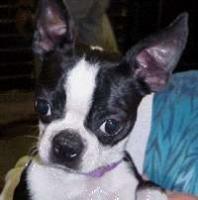 Boston Terriers are known for their cute tuxedo like coats - they are always ready for the ball! I am three years old and would love to see you soon! Leslie Beans. 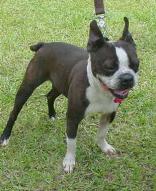 2 year old Boston Terrier Black & White "Beans" is a sweet but VERY shy little girl. She came from a neglect situation and will require a quiet adult household. She is so very malnourished that she cannot be spayed, the vet feels it will risk her life. ON TOP OF IT ALL....... Beans is VERY HIGH HEARTWORM POSITIVE! We will be raising the money over the next 2 weeks to help pay for her heartworm treatment. If you would like to contribute, please send it to: SHHS P. O. Box 768 Powder Springs, GA 30127. Beans cannot be adopted until she has been treated and time is of the essence. He is around ten years old and is missing one eye due to an injury.He is sweet,well mannered and was probably an inside dog. Typical black and white neutered male. are interested please let me know.